Lift-up door through which an artist enters or exits the stage from below. Mobile light fixture attached to the flies. Platform for walking from one side of the stage-house to the other; it is used to install and move equipment. Horizontal strips of fabric lowered to hide the parts of the flies that are visible from the house. The upper part of the stage-house, equipped to hang and handle sets and lighting fixtures. Architectural space that contains the sets and in which the artists perform. Area where musicians are seated to accompany the actors onstage. Metal curtain that can be lowered to separate the stage from the house in case of fire. Retractable vertical cloth forming the background of the stage. Area at the back of the stage whose set is often made to suggest distant places. Area located beneath the stage. The area seen from the house where the artists perform. Piece of fabric separating the stage from the house. Area located in front of the stage curtain. 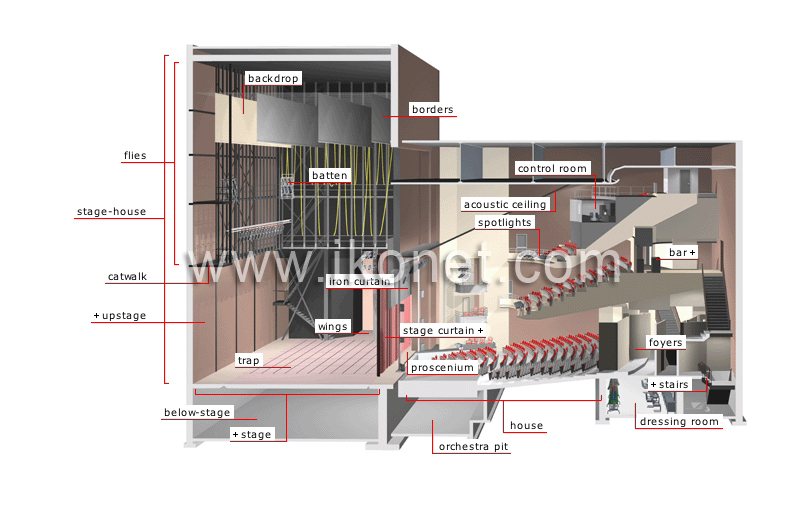 Area hidden from the audience; it is located on each side and behind the stage and sets. Area where alcoholic drinks are sold. Room that the artists use to change costumes, apply makeup and style their hair. Lighting device that projects a concentrated beam of high-intensity light. Space used by the audience before the performance and at the intermission. Part of the theater built for seating the public during a performance. Ceiling made of materials that help to project the sound into the house.